Materials & Methods developed integrated digital media installations within a new 17 story executive tower for the State Employees’ Credit Union located in downtown Raleigh, NC. SECU Executives wanted to find a dynamic way to engage visitors entering into their new office building, and to explore opportunities to incorporate digital signage on each floor of the building to provide wayfinding and reinforce their identity. SECU also desired to integrate state-of-the-art audio/visual systems into the building’s new conference and meeting rooms. Materials & Methods developed five unique content scenarios for the video wall as a result of creative workshops conducted with SECU executives and the architectural team of O’Brien Atkins. The content scenarios include: Color Fields, Vistas, Ink and Water, Patterns in Nature, and State Employees of North Carolina. Painterly animations and abstract interactive art content is designed to engage and inspire visitors entering the building’s lobby, while evoking a sense of playful curiosity. Other content scenarios such as “Vistas” allow guests to move in front of the video wall to select images which then unfold to reveal sweeping panoramic photographs of some of the state’s most beautiful landscapes. The interactive content was produced and directed by Materials & Methods and then programmed through an ongoing collaborative partnership with Float4 using a RealMotion interactive server. Additionally our graphic designer team worked with programmers from the Whitlock Group to develop custom interface designs for the various Crestron touch panels that control audio/visual and lighting systems throughout the building. In the first floor lobby of the building, our team designed and managed the implementation of a gesturally interactive art video wall comprised of eighteen 55” Christie LCD displays. The staggered configuration of LCD displays was surrounded by diffused glass panels that are backlit with low resolution LED video tiles. The LED and LCD technologies were combined to create a virtual canvas where content would flow seamlessly between high and low resolution areas. Compared to other high-resolution options, combining these technologies allowed for a larger canvas area at a much lower cost and created a more interesting composition. In the building’s elevator lobbies, pairs of vertically oriented 46” Samsung LCD displays serve as digital signage directories. The background content for the directories is programmed to correspond to the large interactive wall and reinforce a sense of visual continuity between the lobby area and the building’s upper floors. 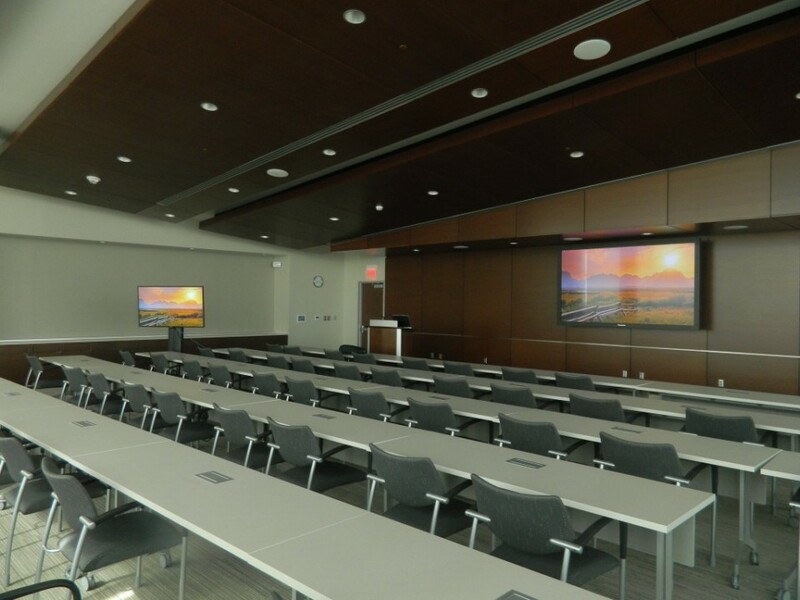 Working with AV integrators the Whitlock Group, Materials & Methods also designed and managed the integration of audio/visual systems for a large multipurpose conference room and employee meeting rooms. Integrated technologies include: LED video displays, interactive content management systems, IR video cameras, audio/video conferencing systems, multiple 55”, 70” and 103” LCD and plasma displays, Crestron Control Systems for lighting, shades and audio/visual controls, floor and wall mounted media hydrants, and integrated microphone/speaker systems.